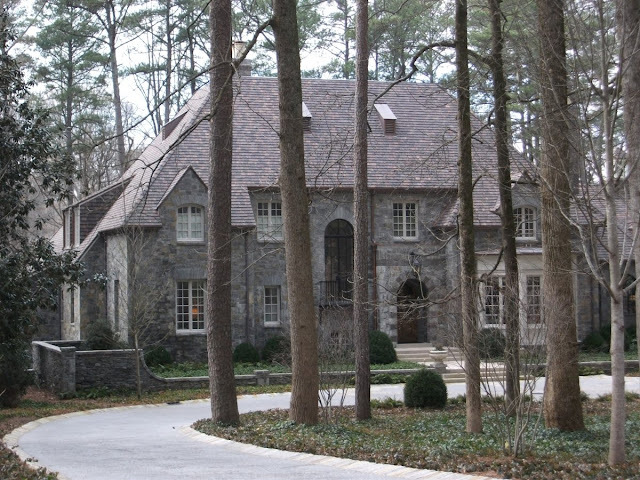 On a large wooded lot in Atlanta's exclusive Tuxedo Park neighborhood sits this architectural gem. I discovered the house last year when it was close to completing construction and was quite intrigued by it. It is grand in scale, but no architectural integrity was sacrificed in making it so. Quite the opposite, in fact. There is much to enjoy about this house designed by rising talent William B. Litchfield in collaboration with esteemed Atlanta landscape architect John Howard. From the street the house is somewhat private due to its maturely landscaped lot. Instead of cutting all of the trees down (which unfortunately happens all too often in Atlanta), they were preserved in what I consider to be an optimal design. An architect friend shared with me that it's desirable to have a house reveal itself slowly as you approach it. I immediately got it when he told me this and definitely appreciate that sentiment more and more. The next few photos (click any of them to enlarge) allow us to study the architecture a bit. At least as much as is possible with the limited sight through the trees. We'll start with the driveway. 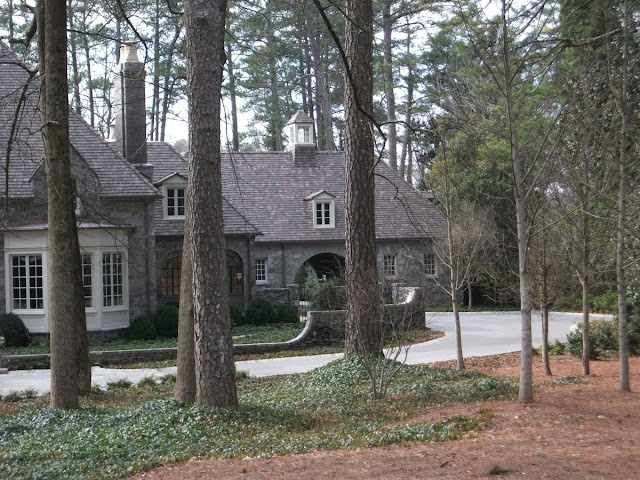 As is typical with many Atlanta estates, the driveway is lined with a cobblestone border. Instead of loose pea gravel for the core of the driveway, they used concrete impregnated with pea gravel which yields a similar effect with less mess and maintenance. I like a driveway in either of these configurations. They are so much nicer in appearance than plain concrete. There is one break in the trees where I was able to get this somewhat clear shot from the street. Excepting the bay window, the house's entire facade is made up of some type of fieldstone (Tennessee perhaps). 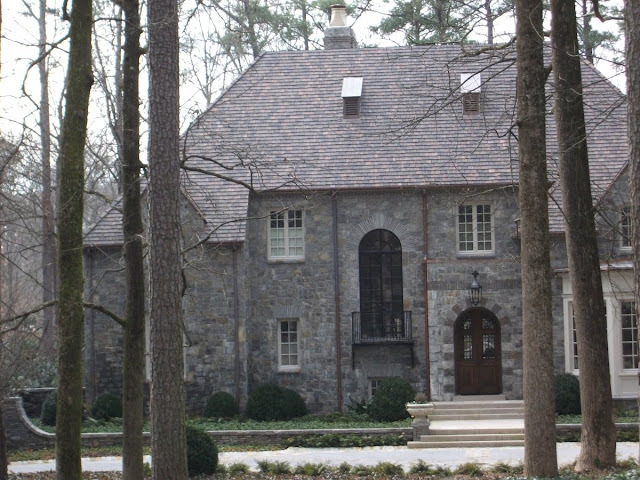 I'm noticing a proliferation of new stone houses in Atlanta lately, especially the Texas limestone variant. I appreciate the divergence in stone type here. The gray with subtle tan tones is excellent - kind of dark and moody, especially on the overcast day that I took this photo. The brown tile roof compliments the stone well too. I find the tall steel window and Juliette balcony to the left of the entrance interesting. It presumably is placed between the first and second floors given the placement of the entrance and the surrounding windows. I suspect it provides a view from a halfway point in the stairs leading to the second floor. If you look closely, you'll notice there is also a window below the steel window. That confuses me a little. The stairs must go all the way from the basement to the second floor and each window is positioned at a landing point. The dormers (are they called that when there is no window?). I always like this diminutive style of dormer. They add just the right amount of architectural interest. This roof style where it has a cut in the center section instead spanning the entire elevation. I've seen this a couple times and find it interesting on a hipped roof. The finely cut stone details above the entrance and windows. The dental molding below the eaves in the center section of the house. Again, not sure if that's what you call that detail in that location, but it looks similar to dental molding you'd see on the inside of a house. The subtle banding on the chimneys. The landscaping and the hardscaping, especially the low wall on either side of the walkway to the entrance. Given my lack of knowledge of specific architectural details, I'll have to send this house over to the folks at Atlanta Homes & Lifestyles magazine to have them investigate. If you don't already follow their blog, I recommend checking it out. They are starting to update it more regularly and the content is coming together nicely. I am particularly enjoying a new series they've started where they get the behind the music details about interesting houses in Atlanta. Moving to the right we see there are more steel windows, a perennial favorite of mine. I just can't get enough of the steel windows. Thankfully they're rampant in high-end homes in Atlanta and I can regularly indulge myself. Here I also enjoy the transition of the stone wall's height. To great effect, the wall stays low just long enough for the house to reveal itself. It's difficult to tell from my disadvantaged street view, but I would suspect that is pachysandra covering the ground inside the wall. Another favorite detail of mine in landscapes. This final photo affords a view of yet more of the right side of the house. I must say that's quite a porte-cochere. It reminds me of some Keith Summerour mountain house designs I've seen with the rounded arch. Can someone tell me the name (and purpose - even if only historical precedent) of the tower at the top of the roof there? I hope you've enjoyed this glimpse of an architectural gem as much as I have. I don't have much information about William B. Litchfield other than that he has worked with or for Norman Askins, one of Atlant's preeminent classical architects. I do know he did a renovation project that was recently on a home tour in Atlanta. You can find more details on the Things That Inspire blog. At any rate, I'm looking forward to seeing much more of his masterful work. Although I have not met Bill Litchfield (yet), I spoke with him on the phone and through email when documenting the house that was on the Cathedral Tour. He is an incredibly nice person - I will send this post to him, and perhaps he will weigh in! I saw this house going up last year, as I used to walk my dog on that street quite a bit. I have been focusing on other areas lately, so I have not seen the house in its finished state. It is beautiful! Funny that you note the window under the balcony. We have the exact same setup on the back elevation of the house that Stan designed for us. We have stairs on the back of the house, and the stairs go both upstairs and downstairs. The area where the stairs are located are going into a subterranean area of the basement (since we will have a walk out back yard - only the side of the basement is daylight), so Stan put that little window in there to bring in some light to the stairwell and the basement. I will email you the sketch. I've always been intrigued and wanted to know the name and purpose of those towers at the top of roofs! I anticipate finding out hopefully here on this blog. It is a beautiful home, and certainly full of surprises on the inside. Thanks for this beautiful post! I'd call that little thing on the roof a lantern. I like the low wall curving up at the edges along the driveway. It seems very formal but inviting. I also like the asymmetry: it keeps my eye moving and exploring particularly in this light. I'm glad you are out there getting pictures now. These houses nearly disappear when things green. @Things That Inspire: Thanks for the link to Bill's website. I'll certainly be watching for it to go live. @Tina: I just had a reader email me and mention that the tower is a cupola. How did I forget that? I know what cupolas are. I need to work on my posts earlier in the day, clearly, as I tend to get a bit sleepy and forgetful at night. @Terry: You're right about capturing some of these houses now while the landscapes are in hibernation. I have several posts lined up that I'd like to do, but have been reluctant because many of the things I want to photograph look much better in the Spring and Summer. But there are, as you point out, some that won't be possible then when the trees and bushes hide things. J, If you have permission to get on the property in spring it's that's the very best. But I thing the test of the landscape is how it looks in winter. This one looks pretty darn good in winter. Bill is a wonderful person and an extremely talented architect! What I like about his style is his "preservation" bent and unique touches as mentioned in the blog. Great job again Bill! This is actually not the first time Mr. Litchfield's work has been featured on this blog. 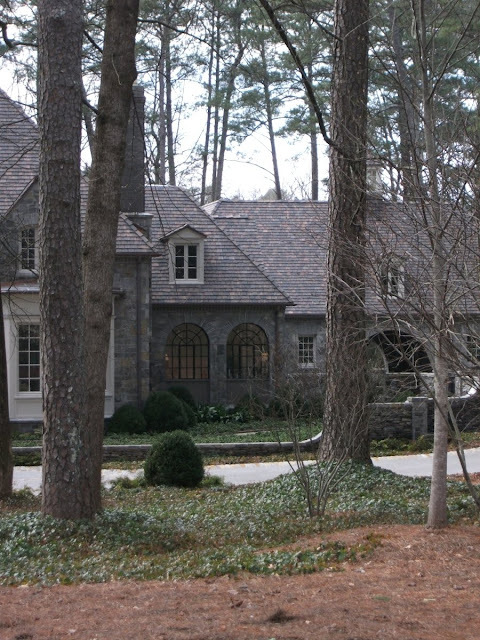 He played a major role on a smaller Atlanta home that also appeared in the November or December issue of House Beautiful. @Terry: Agreed, you've done something right if the landscape looks good in Winter as well as Summer. That's one of the reasons I personally prefer Fescue over Bermuda and the other grasses that go dormant and turn yellow in the Winter. I really dislike that look. And Fescue is amazing in the Spring. @Anonymous: Thank you for the tip. I didn't realize Mr. Litchfield collaborated with the Brinsons on their home. nothing thrills me more than to see bill recognized for his amazing talent....an incredible eye...classically trained yet not afraid to break the rules in the most appropriate and fabulous way!! Beautiful, beautiful home! Love to imagine the interiors. And, you are so right about winter landscaping. If the curb appeal is great in the winter, someone really did their job perfectly!. I was fortunate enough to work with the owner as he was part of the Piedmont Driving Club building committee. Very nice man with incredible taste. The interiors are done by Jackye Lanham. I suspect you may see the interiors of this home photographed in a future magazine spread. The house took over 2years to build if I remember correctly. I was surprised when I read that this was a new build . It looks very settled in its setting and it has an interesting look. There are so many rules and regulations in the UK and planning boards to get past and conservation area groups of residents with clout, that all the creativity is knocked out of many plans and what is left is a box that looks like an office complex!. We also seem to have our fair share of 'Footballers wives' and Russian billionaires who want to live in minature Buckingham palaces. Suprisingly, these people don't have any problem building their monstrosities !! Indeed, it is magnificent. Thank you for sharing the photos and information. Thank you for sharing. I truly enjoy your blog! James, so sorry for my late comment. I have been on a blogging break. I absolutely love this series. You describe all the shots so well. I am a huge fan of John Howard, so I love to see his work. Love the arched doorways that remind you of Summerour. As you know, that's one of my favorite elements he uses. Cant wait to see the next installment of the series. 1) The stone is Cherokee Buff or Cherokee Gray and comes out of North Georgia—you can't beat locally sourced materials! Bill said that he wanted to stand out from the common Tennessee buff Colored stone (commonly called crab orchard). 2) Funny someone mentioned the roof vents (dormers). Bill pointed out a few homes on our drive where he thought the dormers were way too big. He said they were traditionally kept small and subtle, or as the author so accurately described them above—diminutive. Can't wait for everyone to see more photos of the interior and back yard - you won't be let down! Could it be that the "lantern" on the roof is for venting, or for letting in a little natural light in the attic space, or both? I have often wondered how one could vent an old fashioned big attic fan in a way that would be architecturally pleasing. Egyptian colonial style houses often had a "wind tower" at the top of their houses which looked something like this, and that style was sometimes adopted around the Mediterranean, espcially in Greek villas. It was in fact a natural vent which sucked hot air up and out of the house. Could that be what this is? Does anybody (the architect??) know?